Really like the post about the importance of faith in the future of green cities, I too was drawn to the importance of faith based organizing, the role it's played in the past as one of the leading agents of change. Just to expand on that idea is the idea of change which we have touched on in class, how it is created and who drives it. Many of the posts this week have touched on it. Another earlier post stated the shift to renewable energy only after those which we currently rely on have become sparse. I think I brought up the idea a few weeks ago about how change only happens when the system is ready for it. Meaning change will happen when the system can no longer rely on how it runs, it is no longer economically feasible. I have to admit I'm still not 100% sold on this idea (or maybe I just don't want to be) but it is an interesting idea to consider. Is the system ready for change? Will people make the shift to renewable energy? Apollo brings up many points showing how much renewable energy is becoming the less costly alternative. Much of the writing this week focused much more on incentives and teaching rather than on shift of mindset. Mostly this is due to the topic (energy tends to be a bit more cut and dry), nonetheless it was a welcomed change for me. During the last behavioral change journal meeting my group got into a discussion about the validity of many of the ideas we have been reading about. They are on such large scales and require such incredible behavioral shifts as well as money, that they just do not seem possible. The Apollo reading laid out many possibilities of incentives based programs which work to make cities more sustainable, but also don't bankrupt the city (or turn into failed Utopian dreams). I have for a long time been a fan of incentives based programs. As for the specifics after the bit of rambling I just did. The programs I found most interesting in Apollo were those which effected multiple communities, of different income. One of these was in Cayuga County in NY. The idea of collecting manure from different farmers and then processing it into energy, while cleaning the manure. They take a assets based approach (instead of just focusing on what needs to change) to create positive outcomes for farmers and for the whole community. This approach is an important one because it incorporates what is already there, instead of trying to create something completely new. Farmers want their manure taken away, community members want cheaper energy, everyone wants clean water, I don't see the problem. Throughout the semester we have learned how much energy and ecology could be saved by stopping urban sprawl and growing inward. At first it was a hard concept for me to grasp because the typically American ideals seem to promote spreading out and owning land. I was skeptical about the idea of living in close proximity or sharing a wall with a neighbor and I didn't think about it as life enhancing. After visiting Eco- city Ithaca I found that co-housing isn't so “backward” or scary and I can actually see the benefits of living in co-housing communities. To understand more about what could be done in cities to promote the idea of sustainable community, growing inward and co-housing I read Building High- Performance Cities in the Apollo pamphlet and Housing and Community Development in the Toward Sustainable Communities handout. The Housing and Community Development Chapter states that in order to have positive community development it requires good urban design, community programs, governmental policies and initiatives and physical characteristics that draw people together to promote an atmosphere of peace, security and pride. The chapter takes a holistic approach to sustainable community development because it addresses social equity, health and safety and environmental issues. The chapter stressed the need for affordable housing especially co-housing. It listed many affordable housing programs, such as Habitat for Humanity, Urban Homesteading, Mutual Housing Associations all of which build, manage or maintain affordable co-housing. The Build High-Performance Cities chapter gives ides on how to build high-performance cities and gives examples of what cities are doing now to create smarter growth. For example Portland Oregon has enacted a urban growth boundary. This will help limit urban sprawl and promote growth with in the city. Other ideas in the chapter are Investing and rehabilitating existing buildings instead of moving outward. Programs Don't Move Improve help reinvest funds to fix older buildings instead of constructing new ones. Transit Oriented Development (TOD) is a way to decrease reliance on fossil fuels and increase public transit us.. Building housing developments by transit hubs makes pubic transit more attractive.Another way to stop urban sprawl is to charge fees directly to suburban developers for the new infrastructure costs instead of incorporating them into the city's budget and letting tax payers pick up the tab. Before reviewing the previous posts my idea was to talk primarily about geothermal energy and its overwhelming energy benefits. Once reading the posts i noticed that the one prior to mine was about a similar topic, it was a very inspiring and well written posts so i will attempt to continue on the path that was set forth by that post the best that i can. Overall i have been extremely torn about my stance on renewable energy. When studying for the LEED examination i learned a lot about small scale renewable energy use in single building situations. From my interior design/architecture perspective it is a very costly and difficult idea to employ. Very few clients are ever interested in renewable energy sources due to cost/space/ and aesthetics, despite the tax decreases that often come with the conversion. As a member of the industry i had to agree with these concerns. I do not want to sound negative or pessimistic but i do understand the unattractive side of renewable energy, but as a conscious and aware person i realize that the way in which we consume and view energy is unacceptable and could lead to a societal demise if not modified. That being said in my confusion about renewable energy i began to research a lot of the lesser known methods and realized that not every renewable energy source has the negative effects that solar panels and wind mills do. 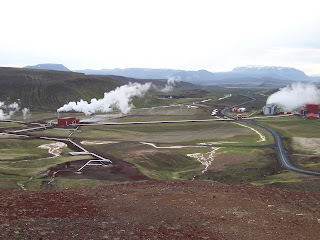 One source that really began to intrigue me was that of geothermal. From what i have been exposed to this is a much lesser known and less talked about renewable energy source. I realize that a large portion of this may be the fact that it can not be accomplished on an individual level. The process of digging enormous holes into the earth and building a small power plant above this hole. Although this source would need to be done at an infrastructure level i believe it has enormous potential. It has very little environmental and habitat impact and the EPA has gone as far as to call geothermal heat pumps are the most energy-efficient, environmentally clean, and cost-effective systems for temperature control. it has been found that direct use and heating applications have almost no negative impact on the environment. Geothermal power plants do not burn fuel to generate electricity, so their emission levels are very low. They release about 1 to 3 percent of the carbon dioxide emissions of a fossil fuel plant. Geothermal plants use scrubber systems to clean the air of hydrogen sulfide that is naturally found in the steam and hot water. Geothermal plants emit 97 percent less acid rain - causing sulfur compounds than are emitted by fossil fuel plants. After the steam and water from a geothermal reservoir have been used, they are reinjected back into the earth. Finally, they are fairly pleasant to look at, an issue that i must admit is very important to me and my industry perspective, at the top of this blog i included a picture from wikipedia show a series of geothermal plants in Iceland and in my perspective i think that it is a very attractive options, especially in comparison to what we have today. I wanted to end by saying that although i am very excited about my new found knowledge about geothermal and renewable energy i do not think that it is the ultimate and only form of energy out there. I strongly believe, as with almost all topics of sustainability, a balance is needed we need to explore all forms of renewable energy and employ different forms in different situations. There will never be one answer to sustainability is is finding a complete balance a balance that is greatly foreign and needed in our energy crisis that we are faced with today. I read the chapter in Towards Sustainable Communities related to energy efficiency and renewable energy and the chapters in New Energy for Cities related to renewable energy and building performance. The readings supported my belief that renewable energies are now ready to take over the world’s electrical grids. As more coal plants get cancelled and even prohibited in some places, we will see further economies of scale of renewables further making these highly adaptable and suitable for sustainable growth. From the first reading, it was very interesting to see what cities and utilities are doing to finance renewable energy and energy efficiency. It is typically cheaper to reduce energy use than it is to expand energy capacity. Many utilities do not understand this. Some utilities in the West (such as PG&E) actually provide incentives that reduce energy use in households, giving both homeowners and themselves the benefits of prevented energy expansion projects. In addition, such incentives are key to maintaining a vibrant economy, as the financial savings that homeowners accrue multiply across the economy as they flow. Another great example that came to my attention was the deep lake cooling project in Enwave, which uses cold water from the depths of Lake Ontario. Cornell has a similar system called Lake Source Cooling that cools the campus during the summer. In the Apollo Alliance reading, there are many excellent examples of how cities are taking first steps. It makes a clear argument that renewable energies are not cost-competitive with fossil fuels, yet it fails to mention large renewable energy projects, of which there are many. I think the best case studies are those in the area of building standards and energy efficiency, where cities like Seattle, Dallas, and Chicago have set standards or provided incentives for green buildings. It is unfortunate, however, to not see an example of where standards for new buildings have been set for entire cities. This is a bold step that would probably require subsidies to offset the additional costs to low-income people, but it could well be funded with some type of energy efficiency mechanism that includes, for example, zero-interest on long-term payments. In spite of all the great tools and examples being shown in these readings, these all fall short of what needs to take place to eliminate the use of fossil fuels. Cities need to be more committed to setting standards city-wide for energy efficiency and to training citizens to do these kinds of jobs. They also need to find ways of procuring more renewable energy in the city. One large obstacle, of course, is that there aren’t many states giving worthy incentives. In addition, the federal government hasn’t taken energy as a priority at all. Reducing energy use by roughly 10-20% is important, but it will not do the job we need to do. I think any overview of energy efficiency and renewable energy needs to discuss the underlying reasons for these. It also needs to discuss what the barriers to implementation are in a larger scale and what the possibilities of getting to that scale are. In "New Energy for Cities" the section "Build High-Performance Cities" mentions Location Efficient Mortgages (LEMs). Pioneered in Chicago, LEMs promote transit-oriented development as well as affordable housing. The Apollo Alliance recognizes that TOD's can often been priced too high for low to moderate income (LMI) families. According to Apollo "LEMs allow homebuyers to capitalize on the savings that result from living near transit service ... by calculating these savings into the purchasing power of the homebuyer." (p 37) LEMs can add increased borrowing power of $30,000 to $50,000. Currently LEMs exist in Chicago, SF, Seattle, LA and Madison, WI. I'll follow this synopsis with a more in-depth look at LEMs and then an outline of Chicago's CityMortgage Initiative, which is highlighted in the Apollo Text. You may qualify for a home mortgage when you thought you couldn't or be eligible for a larger loan than you expected based on the purchase of a home in a location efficient community. The Location Efficient Mortgage®‚ (LEM) is a mortgage that helps people become homeowners in location efficient communities. These are convenient neighborhoods in which residents can walk from their homes to stores, schools, recreation, and public transportation. People who live in location efficient communities have less need to drive, which allows them to save money and improves the environment for everyone. The LEM combines a low down payment, competitive interest rates, and flexible criteria for financial qualification to allow more people to own the home of their dreams. Further studying the FAQ's and other areas of the website cited in the Apollo guide I became increasingly aware that although this might be a powerful incentive tool for people of middle income to locate to TOD's the LEM does not appear to be that powerful a tool for low to moderate income families, as recorded by Apollo. Within the metropolitan areas I have mentioned, just from my own knowledge, for low to moderate income families to settle in new center city developments, they would need a more substantial subsidy program towards housing. LEM's appear to be more of a program to incentivize people to locate in TOD's (not a bad thing of course) but not really a promotion of affordable housing as Apollo writes. This website acknowledges that as transportation and housing are the largest expenses for many families there should be a way of combining the two. LEM's do address that issue but it appears they have not had the effect that was hoped. Note: although this was not directly based on energy efficiency, I was intrigued by LEM's as a powerful tool for promoting affordable housing at TOD's and so I decided to give this further exploration. I was very glad to learn of our new assignment last week as the origin of my interest in green cities was in renewable energy. There is such a huge amount of work being done in this area and it’s about time we delve into it. I see there is one major issue with renewable energy today. For decades different types of energy which can be considered renewable (solar, wind, and hydrogen), and clean but not quite renewable (geothermal and nuclear) have been available. Only recently however we are seeing the emergence of these resources becoming mainstream. Why is this you may ask? Well, only recently has the government had problems getting oil- or claims they are having problems (a whole different issue). The reason why coal and oil is so cheap is because it is highly government funded and subsidized. If the government bothered shifting its funding to different types of energy sources there would not need to be a whole “movement” to have the use of them widespread. 1. Renewable energy resources do not emit carbon during energy conversion. As mentioned in a previous blogpost, fossil fuel plants are very inefficient. This leaves plenty of room for carbon to romp around warming our atmosphere. 2. When harvesting coal or natural gas, there is a great deal of land abuse. Mines are dug hundreds of feet inside mountains ruining the structure of the land. This destroys habitats of native species as well as makes the surrounding areas ugly. Also, do you want a coal burning plant near your home? I don’t! It smells and looks awful. 3. One repercussion of fossil fuels that many people neglect to consider is the pollution of water. Runoff from plants contaminates water supplies for humans and other animals. Renewable energy is clean and does not have any waste so there is little to worry about along the lines of water pollution. Economically there are also several benefits which were spotlighted in the chapters in Green Urbanism called Living on Solar Income. Solar energy is very unique as it will actually pay for itself within roughly 10-15 years. This means that if you install solar cells in your home now, in 15 years you will have saved a considerable amount on energy use. Also, many jobs are created as solar cells must be installed and maintained of the years. An interesting aspect of renewable energy is to look at geothermal and nuclear (fusion) power. Even though these are two “almost renewable” types of energy what impact may they have on the environment. Geothermal power entails the drilling down hundreds of miles into the earth’s core to get heat which is converted to energy. What impact will this have on the earth and its internal temperature if any? So, while being cautious around nuclear and geothermal energy, the other renewables seem very feasible and beneficial to society. Now, all it will take is the government to subsidize renewable energy and we no longer need to get “burned”. This whole semester we have discussed sustainability as a system that requires participation and dedication at all levels of society. Moreover, we have discussed the necessity of changing our patterns of consumption and creating a new paradigm of self-awareness and respect for the natural environment. In my mind, there is no better way to promote this paradigm than through religious institutions. Religious institutions have the power to shape world views, influence opinions, and captivate the minds of an open audience. Consequently, we should use these organizations as a resource as we seek to inform and educate the population about energy efficiency, economic multipliers, and the like. As Roseland suggests in his book Toward Sustainable Communities, interfaith coalitions can be a powerful tool for educating and informing the public. Specifically, he speaks about the Interfaith Coalition on Energy and how it has helped religious communities within Philadelphia reduce their energy consumption and adopt more sustainable systems of operation. The Interfaith Coalition on Energy not only teaches congregations of all faiths how to upgrade their buildings and reduce energy use, but it also provides these congregations with ideas for funding such upgrades. Sadly, I was unable to obtain most of the literature that the coalition produces because the organization does not provide such literature for free. Although the coalition operates almost entirely off of money donated by individuals and congregations, it still requires that communities of faith pay for the services offered—services such as printed material (pamphlets and books) and workshops. Interestingly enough, the Interfaith Coalition on Energy does not focus all of its attention on ecological sustainability awareness. Although the coalition’s website describes energy efficiency and reduction as a holy practice, it sells its services by highlighting the economic benefits of sustainable behavior. Specifically, the group helps religious congregations save money by improving energy efficiency and reducing energy consumption so that these congregations can invest more money into non-profit work and community services. For example, the coalition recommends that religious congregations purchase the least expensive energy that is available (even if the energy is produced by fossil fuels) and that the congregation continually hunt for lower prices. Despite this slightly discouraging practice, the coalition maintains a high level of commitment to the natural environment. Below I have posted the ten declarations that they use to justify sustainable energy choices. For this week's assignment, I chose to read The Apollo Alliance's "New Energy for Cities" and Mark Roseland's chapter on Energy Efficiency and Renewables from "Toward Sustainable Communities." In the past, I have enjoyed reading Beatley's compendium of European-based sustainability initiatives, but this time I was drawn to look at some viable North American programs as well. I also enjoyed reading about so many different options in how sustainability is being addressed by different regions. My readings this week continued to solidify an important lesson that has been formulated for me during this course: that sustainable cities require a diverse set of options in order to reduce their consumption and improve civic health. No one renewable resource, technology or green attitude will save an area from dependance from non-renewable resources. Rather, each community will have to diversify and look at a wide array of local options in order to move forward towards healthier systems. Increased community participation in civic decision-making and more social justice initiatives can help expand a region's green options by tapping into the knowledge and energy of a greater proportion of the population. Of course, creating site-specific and diverse sustainability options will tend to create very complex systems, but systems thinking approaches can help to sort this out and provide us with a deeper understanding of the immensely productive potential that ecological (and humans are included in this!) diversity can create. The Energy Efficiency and Renewables Chapter from "Toward Sustainable Communities" by Mark Roseland mentions cooperative wind turbines as an example of a useful green power program. The short paragraph focuses on Danish cooperatives that has joined together the efforts of over 150,000 Danish families and 6,300 wind turbines. The opportunity to research this amazing project was too good for me to pass up. I found it interesting that the Middelgrunden wind turbines are placed offshore of Copenhagen. I have never seen offshore wind turbines in person, but I have often wondered why Toronto does not consider such an option in their quest for renewable energy sources. One of the arguments that I have heard against placing wind turbines offshore of the city is that people don't want such windmills marring their view of the water. I happen to think that wind turbines can be quite beautiful, and from the publicity statements from the Middelgrunden project, the Danish are very proud of both the energy production and aesthetic quality of the wind turbines. At this point, I think that the usefulness of wind turbines as a source of green power should outweigh our aesthetic condescensions. Well over 18% of Denmark's power supply now comes from the wind, and according to Wikipedia, Denmark isn't even all that windy! If Denmark can do this, why can't the United States and Canada? I found the two readings, “Energy Efficiency and Renewables” and Chapter 9 in Green Urbanism to be extremely useful. As I was reading these chapters, I kept thinking about how the different tools discussed could be applied to my own community. I decided to look into district more in depth, since before doing these readings I had never even heard of this method. So, I used Wikipedia (don’t judge! The article is referenced), and I now I better understand the concept of this system. Say you have a regular steam-electric power plant, where electricity is generated through the burning of fossil fuels to create steam to move a turbine. In this traditional mode of production, the process converts only 47% of the fuel into electricity; the rest is lost as heat, which gets dissipated into the plant’s surroundings. With districting heating, a cogeneration plant is used. In cogeneration, the heat that usually gets lost is trapped and used to heat homes nearby. The heat is transferred through insulated pipes, either in the form of hot water or steam. While this form of power generation does greatly reduce the amount of fuel needed to power and heat homes, it is very expensive to install. District heating would be practical in a new community with high density, but to implement it in an existing low density suburb would be silly. One of the problems district heating is experiencing in the United States is that it is poorly funded and maintained by power plants. As a result, the quality of the systems has deteriorated and not as many people get their heat through cogeneration plants. However, “Energy Efficiency” mentions the fact that district heating doesn’t necessarily need a power plant to be viable. For instance, a new hospital or school could include a higher capacity heater, and the excess heat produced by the new building could be distributed to nearby residential developments. This is particularly significant to proposed communities like the SouthWest project in Ithaca. A district heating system could be installed in a community center or other public building and then used to power the more high-density buildings. The heating system could be community owned and operated, leading to greater neighborhood capacity and sustainability. I really like the idea of using public buildings to set examples for the rest of an area. In Green Urbanism, the author mentions Colorado’s Rooftop for Schools Program. Besides setting a positive example, a program like this has the potential to help generate revenues for an area that can always use extra funds. While researching wind energy for my group project, I ran across an elementary school that installed a single windmill and was able to sell the excess energy it generated back into the power grid. The profit was used to make improvements to the school and generally create a better learning environment for the students. This whole bit got me thinking about the possibilities of installing solar roofs on public schools in Baltimore County and what that would mean for not just the schools, but the entire county. Parents would become more aware of solar options, and individual solar units might not seem as futuristic and unattainable. Green Urbanism mentions how cities in Europe compete with each other for the title of most solar-oriented, and I feel that his type of mentality could easily be applied to the state of Maryland. Counties are constantly competing with each other for business and population, so why not compete with each other for leadership in sustainable options like solar power? Howard County has already appointed itself as the leading green county, and I have a feeling other county executives won’t be far behind in trying to claim this title. behavior change, community participation: Providing the community with a symbol of environmental mission for the citizens to share (i.e. ; architecturally striking power plant that gives the citizens of Viborg, Denmark a source of pride (Beatley 261).) 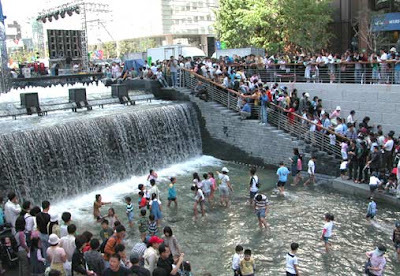 In another class, I remember reading from the book (also website) “WorldChanging” about a river in Seoul, Korea, that had been completely paved over for decades, but he city had instituted a project to uncover the river and develop its banks as public spaces, and giving the people their river back. The symbol the water, a life source, being resurrected, was incredibly inspiring for the citizens of Seoul. behavior change, systems approach: Beatley’s example of the “political dynamic” in Germany that facilitates the implementation of renewable energies. This simultaneous top-down and bottom-up (there is also popular support from the German people) systems approach makes behavior change practically effortless. behavior change: Beatley’s example of carbon tax (stick) in Sweden resulting in dramatic rise in use of biomass energy, which results in significant savings for the community (carrot). systems approach, behavior change: Beatley’s example of the city of Heidelberg’s incentive-based contract with private companies which allows for the companies to keep a high percentage of the money saved from the energy-conservation measures, while a smaller percentage is reinvested in the city. (This is a similar strategy to the Case Presentation Carlos gave in class!) Roseland mentions this type of strategy as well; “economic multipliers”: monies that are saved on energy that are re-invested in the local economy and circulate several times over. This strategy is pure genius, it’s so frustrating that more U.S. cities haven’t realized the benefits of implementation. systems approach, behavior change strategies, community participation: Beatley’s example of housekeepers and building managers put in charge of monitoring consumption meters. behavior change, community participation: Giving citizens free/affordable equipment (i.e., Beatley’s example of Leiden’s energy company giving customers water conserving package of equipment). justice/equity, behavior change, systems approach: Roseland’s several examples of “DSM” or “demand-side management” weatherization programs that improve energy-efficiency of homes and therefore affordability of energy costs for low-income people living in poorly constructed homes. This example is of particular importance to me, as I have worked with families living in transitional housing many of whom were dealing incredible debt just from energy bills near (no exaggeration) $1,000/month (!) because of the poor quality of their homes. I volunteered for the Tompkins County Healthy Homes Project and Weatherization Assistance Program over the summer and it was wonderful to see how the community’s investment in the homes turned into massive savings for the low-income residents. Biomimmicry: many designs that Beatley mentions provide more than one creative response to a need, just as organisms perform synergistically in nature, (i.e. ; Beatley’s example of PVs integrated into road and highway noise barrier, and the various examples of cogeneration). systems approach, community participation: Beatley’s example of the school in Nieuwland with mirrors that project a view of the green roof into the classroom so that the energy of the school becomes integrated into the teaching curriculum. Systems approach, biomimicry: Roseland talks about the six different areas of evaluation for the LEED Rating System. LEED is a systematic approach to ensuring a building’s sustainability, which, if successful, are often inherently designed in the likeness of a living organism.